“ Do you like Michael Klaxon? 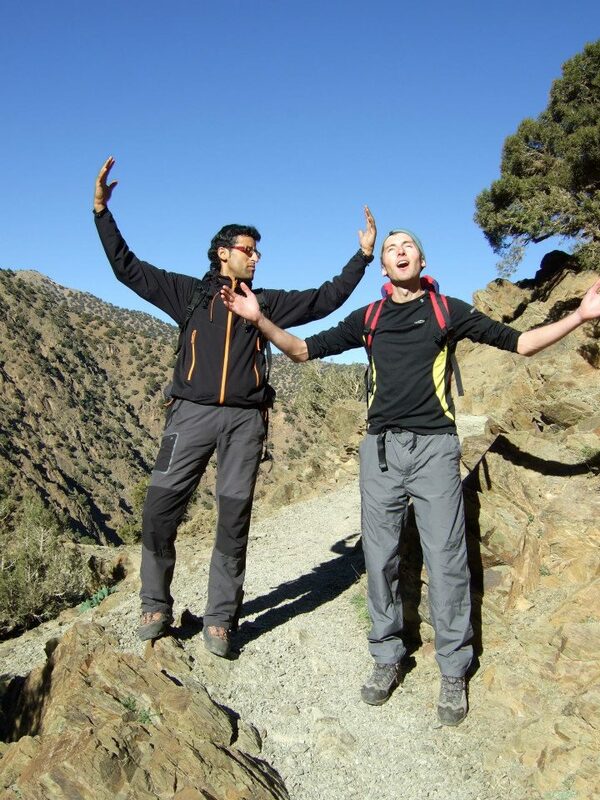 You know, Michael Klaxon, Michael Klaxon from the Klaxon Five, the brother of Janet Klaxon.” We were about an hour and a half in to our hike in the Atlas Mountains and this earnest enquiry was being put to us by our guide – soon to be named Loony Knickers – Nuri. A few bars of Thriller followed. For the next two hours, we tried to convince him of the truth – amidst some pretty incapacitating hysterics – but he was having none of it. He’d been to see the Klaxon Five live and that was all there was to it… took us two days to realise he was winding us up. I’d been working in Rabat and had added a week’s holiday on. Jo, Karina and Cian came out to meet me in Marrakech for adventures in the Medina and the Mountains. 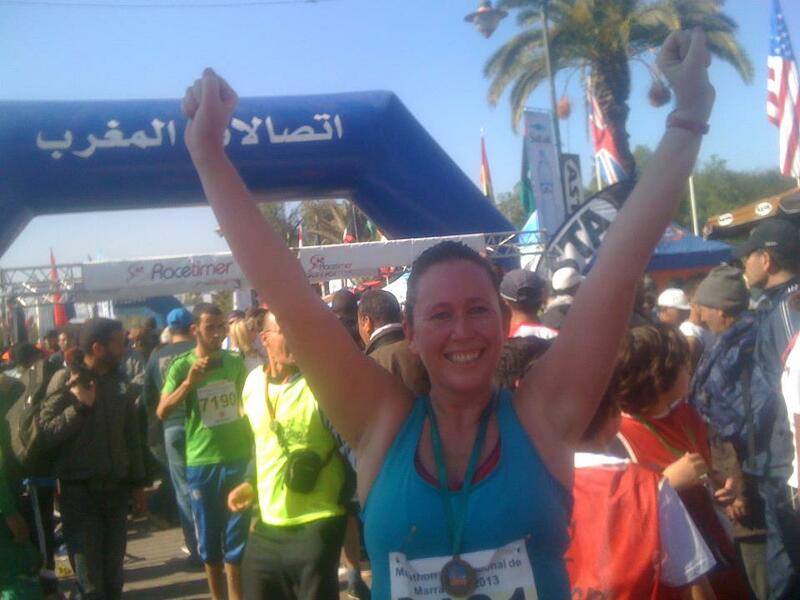 I’d started the week with the Marrakesh half marathon. Very nice running conditions and Charlie – travel entrepreneur, racer and buddy – and I triumphed. He did as he smashed his personal best, and I did because I ran all the way even if I was more Tortoise than Hare! After a couple of days of extreme shopping, mint tea consumption and spa sweating, we left the city for the hills. I reluctantly took off my marathon medal which I had been wearing to garner as much attention as possible, and donned the pigtails and hiking boots. There was a very sad moment when we had to leave the gorgeous Riad Samsarra, Princess Jade the resident cat and chef extraordinaire Moolida, but we pushed through. 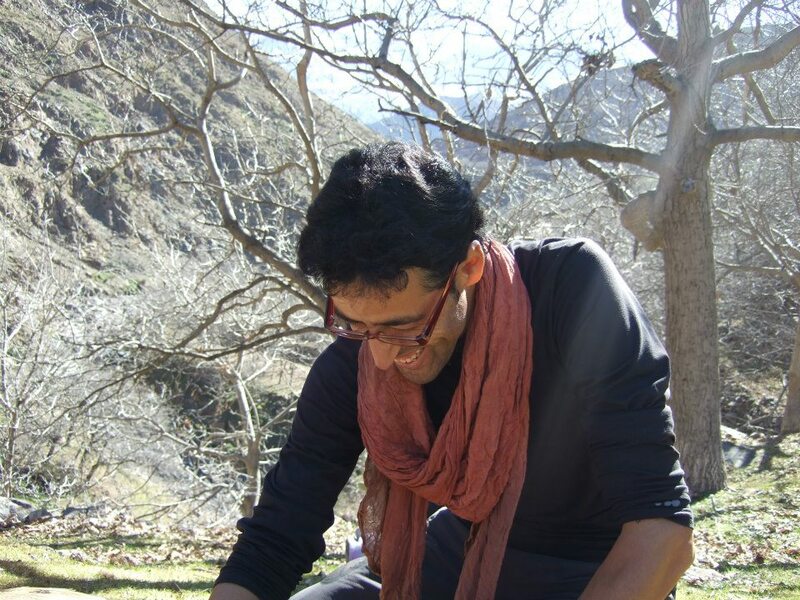 Nuri established himself early on as both loopy and hugely knowledgeable. He also has legs like a giraffe – as does Cian – so the pace was cracking. The Atlas are beautiful mountains. Jagged and covered in snow at the tops, with lots of greenery and terraced valleys sloping down. There are fruit and walnut trees everywhere. 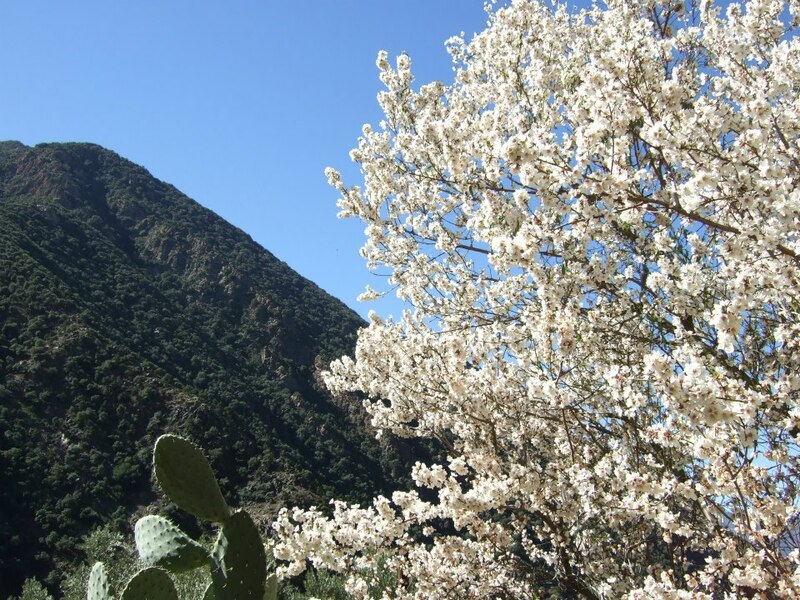 Bare branched at the moment but we found one in blossom – a few weeks and they will be ravishing. It’s always hard to describe the actual hiking. Your legs move (mine at a gentle trot to try and keep up) and you get to see everything around you for a long time, and feel the air and smell the different smells. It was cool and sunny. Perfect conditions with a perfect blue sky. We passed through lots of little Berber villages where we got to practice our newly acquired vocabulary – MamanCadGit and Tshweet. Nuri was asked for help by a mother whose little boy had a nasty bite on his cheek, and brought out the antiseptic cream. He also did a couple of magic tricks and then offered to leave me behind for the village. Well, my Berber would have improved! Eight hours later we got to our first stop – Cian and Nuri celebrated with a full-length, air-guitar rendition of the Final Countdown. Katrina (the mule) wasn’t particularly impressed but we were. We stayed in a newly-bullt hostel beside the Shepherds’ summer pastures, flanked by some high and icy peaks. Icy inside as well. But a big fire, a big dinner and some singing and dancing helped. Day two, we headed up to the high pass where we unloaded Katrina, and Nuri and our brave muleteers broke up the ice on the path so that she could pick her way over it. At the summit, we met a man with a magnificent beard. Silky and auburn and generally mesmerising. The rest of the day was a long walk down and then up to our guesthouse. We had lunch in the shade of Mount Toukbal and got invited for thyme tea in a neighbouring village. As we climbed up out of it, we saw a whole group of boys running up ahead of us. They were heading twenty minutes uphill to the only flat place they could find – where they had constructed a football pitch. We were puffing from the steep drag by the time we got there, but they were all earnestly practising, a whole mixtures of sizes and ages enjoying the game and ignoring the amazing views. Day three we were on the bikes. Charlie left his desk to come and meet us and true to form started us off with a “lovely” long climb up. It’s always worth it though and we skirted round to the end of the valley with lots of downhill to follow. Most of it was on dirt roads but we also had single track skirmishes through the villages – and it was here that I came acropper just before lunch. I was zooming down a loose escarpment and took a corner a bit too quickly. Thud, scrape, bye bye all the skin on my right leg and nearly bye bye £3k’s worth of Canondale bike as it slid a bit too close to the 50 metre drop. It is always a nasty shock to come off and it sobered me up for the rest of the ride but on the plus side, I had an excellent war wound and also the prospect of a week of scab picking. Nuri – bless him – cycled with us. It was his first time on a mountain bike and he coped manfully. 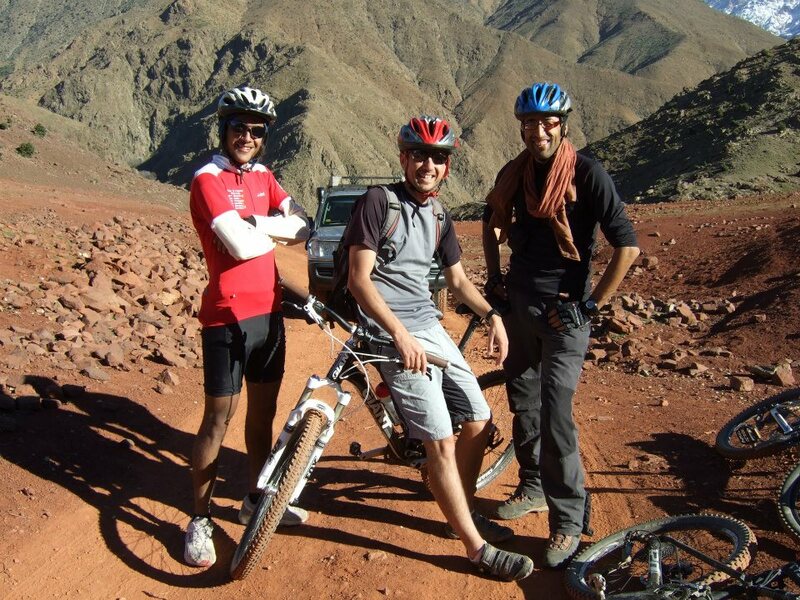 Charlie worried for his life and limb as Nouri careened towards cliff faces, looking over his shoulder and talking ten to the dozen, and I worried for his Zuq which benefitted neither from cycling shorts nor from a layer of fat.. apparently he couldn’t sit down for a week post-ride. That night we were billeted in the most beautiful art deco hotel run by the glamorous Paul and his mother. All the fixtures and fittings had been rescued from villas where wealthy owners were modernising and throwing out the walnut sofas, painted mirrors and iron-worked doors. Our last day was really varied biking up and down the hills and surrounding valley. Lots of very nice singletrack through forests, along rivers and one heart-stopping and satisfyingly nasty descent through a village. Very pleased I made it without a foot down or a further fall! Perfect conditions and another perfect day. Sadly, it was then straight to the airport and back to Blighty but I have already booked my flight back….And if you want a fantastic holiday contact Charlie at www.epicmorocco.co.uk He’ll do you proud! 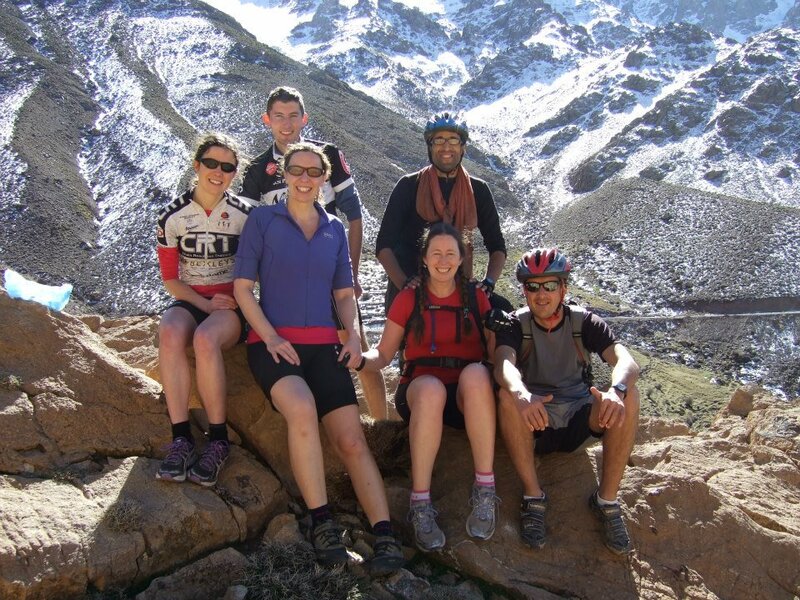 Great Blog Alice, Charlie organised my family holiday at the end of the Toubkal Ultra Marathon last October. Superb country, people, mountains. Charlie and Penny made the trip truly fantastic! Thanks! It is a fabulous country and I am going back next week!